As we head into the holidays, we have a lot of things to keep track of and worry about. 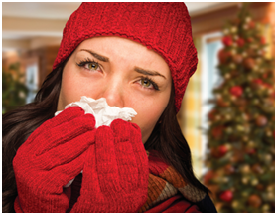 Along with buying the right gifts and avoiding the sweets, we also have to worry about cold and flu season. As the weather gets cooler, cold and flu season kicks in and 2017 is expected to be twice as bad as 2016 when it comes to the number of flu cases. If we want to stay health during the holidays, then there are plenty of steps we have to take. First and foremost, it is important to be a patient of a family doctor who can provide you with medication that can help during those serious bouts of the flu. You should head to your Gilbert medical center as soon as possible to get your flu shot and protect yourself from the latest strains. Take advantage of Complete Care Medicine- we have the family doctors in Gilbert AZ you can rely on for the right flu shots and medicine or treatment services you will need during this holiday season if you happen to get sick. But medication can take time to work, and the flu virus can often be difficult for medication to handle in the first place. That makes prevention your best bet to stay healthy during the holidays, and that means being very careful where you go and who you are around. If there are people coming to work sick, then be sure you avoid contact with the sick people as much as you can. Stay at least arm’s length from sick people, and keep yourself hydrated during the day to strengthen your immune system. The idea of washing your hands frequently to avoid catching the flu is sound advice that medical professionals use. The flu virus can be found on anything you touch throughout the day. The more you wash your hands, the more you are removing viruses you have come into contact with. You should carry a hand cleaner with you to use often to keep yourself clean. Viruses prey on weak immune systems, and your immune system can lose its strength if you are not getting the right amount of sleep every night. If you cannot seem to fall asleep during flu season, then talk to your doctor about sleep aids you can temporarily use to make sure you get a good night’s sleep every night. If you have time to nap during the day, then that will only help to strengthen your immune system even further. Although it is very tempting to eat sweets during the holidays, it’s important to choose healthy foods to avoid a weakened immune system. Eat healthy foods during the holidays, and focus on foods rich in vitamins C and E. If you are finding it difficult to eat enough foods with those vitamins in them, then take supplements during the holidays to give your body a fighting chance at avoiding the flu. Exercise is a great way to keep your immune system active and strengthen it against potential viruses. Try to find 20 minutes per day to exercise, and remember to stay properly hydrated. If it is hard to find time to work out, then do little things like taking the stairs instead of the elevator to help keep your body’s systems moving and active. Of course, an important way to avoid getting sick during the holidays is to stay away from sick people. If you head out to a holiday party and arrive to see many of the guests coughing and sneezing, then it would be in your best interest to go home. If you have time off you can take from work to avoid the sick people who feel obliged to be at their desk, then that will help you to have a healthy and relaxing holiday. Sometimes even the most comprehensive attempts to stay healthy during the holidays are not enough to keep the viruses out of your system. If you feel the flu coming on, start drinking an excess of fluids and getting plenty of rest. The best way to get rid of the flu is to take care of yourself the moment you feel symptoms and push the virus through your system. The flu can be a very serious condition and is not something that you should just ignore. The Gilbert family physician at Complete Care Medicine is there to help if your flu symptoms start to get worse. Don’t let the flu ruin your holidays. Take care of yourself and get to a doctor immediately if you get concerned about the strength of your symptoms.